Here, you will find guides developed for those interested in exploring heritage sites on their own time. 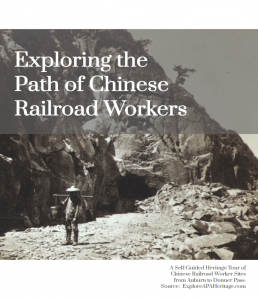 With the support from the 1882 Foundation, U.S. Forest Service and Bureau of Land Management, we are excited to publish our digital brochure introducing Chinese Railroad Worker sites in Placer County and Nevada County in California. This brochure serves as a self-guided tour for adventurers who are interested in exploring heritage sites of Chinese railroad workers. It includes 7 sites from Auburn to Donner Pass: Bloomer Cut, Cape Horn Passage, Secret Town Fill, Summit Tunnel, Summit Camp & Central Shaft, China wall, and Tahoe Catfish Pond. Click the photo above to learn about their stories in this brochure and go explore yourself!